I was not planning on writing a post on Easter Sunday, but some real-life math occurred while preparing for dinner. I am sharing here what I posted on my Math Motivator Facebook page. My ham is 5.49 kilograms. The instructions say to cook it 12-15 minutes per pound or 454 grams. Take it out 30 minutes ahead of time to add glaze. Return to the oven. Let stand 5 minutes before serving. If I want to serve it at 5.00 p.m., what time should I put it in the oven? What Easter math did you have to do this weekend? Round to 5.5 kilograms to pounds x 2.2. In hy head I knew that 5×2 was 10. I mentally multiplied the bits and added together so I got 12 pounds. Then I started at 5 pm. 5 minutes to cool is 4:55. 30 minutes post glaze is 4:25. 5 minutes to do the glazing is 4:20. If the ham is 12-15 minutes per pound and it’s 12 pounds of ham, I can mentally do 15×10 is 150 minutes. 15×2 is 30 so the total is 180 minutes. That is the equivalent to 3 hours. 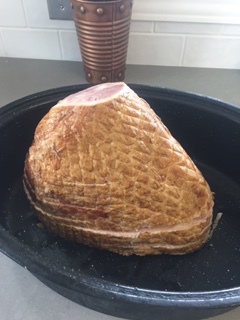 If you want the ham ready at 4:20 then it needs to be in the oven around 1:20 pm (after turning it on at 1:15 pm to heat up the oven for 5 minutes). My sister responded by saying she was having the same problem, so she threw the ham in early knowing that she could always take it out of the oven and wrap it in tinfoil. There are often different solutions to the same problem! Happy Easter! Next Next post: The Easter Bunny Needs Your Help!